Love Italian Food? Follow Your Passion and Indulge! 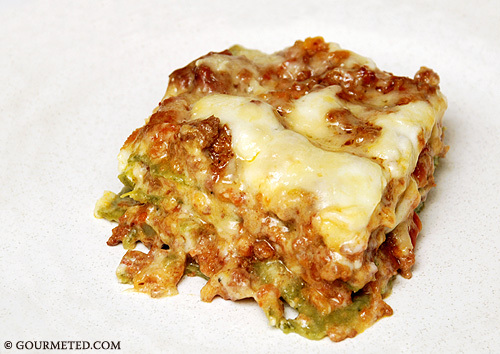 Gourmeted.com‘s featured Lasagne of Emilia-Romagna looks like it’s ready for the best Italian grandma’s Sunday dinner table! Not only does this look delicious, but Joy from Gourmeted.com includes the recipe with instructions, including many pictures of her first attempt at lasagna-making. What a wonderful first lasagna! I know there are many wonderful cooks and culinary enthusiasts out there who share this passion for great food and excellence in our kitchens. Follow your passions and indulge in a custom culinary tour to Italy, where you can take hands-on cooking classes, visit local markets with chefs, tour vineyards, taste wines, and do just about anything else you want to satisfy your culinary pleasures and curiosity. Contact us to start planning your custom tour today! 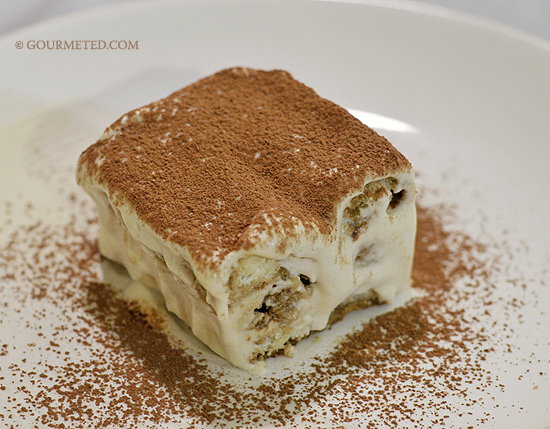 Check out this divine tiramisu made by Joy of Gourmeted.com. Looks just as good as restaurant-quality, but it’s homemade! Read more about Joy and her love of cooking, and follow her on Twitter @Gourmeted. Click on the photo above to view Joy’s recipe. If you love Italian food and want to enjoy an authentic Italian culinary experience, check out Celebrations International Travel’s Tuscany culinary tour. The itinerary posted is only an example of the types of tours we can custom create for your family, group, or organization. Let us help you plan an ideal tour to savor the tastes of Tuscany! View sample itineraries for other featured culinary destinations. In case you’re interested in a destination that’s not featured, contact us. We can customize culinary tours throughout most of the world. This is the text of an article I wrote for WhereI’veBeen.com that was published on their site today. Enjoy! 1. France: This country has a long history of excellent wine-making, and many newer wine-producing regions have learned from the French techniques and used them to produce their own wines. The varied regions of France produce abundant varieties of wines, sparkling wines, and champagnes. Amongst France’s best-known wine-producing regions are: the Loire Valley, Alsace, Champagne, Burgundy, Beaujolais, and Cognac. Visitors to France will have a wonderful opportunity to explore and enjoy the products of this world-renowned wine destination. 2. Italy: The sunny slopes of the Italian countryside are known to produce some of the best wines in the world. Whether you explore the hills of Tuscany and enjoy a glass of Chianti, or prefer Asti from the northern regions or the sweeter taste of Marsala from southern Italy, this country has something to please everyone’s wine palate. Known mostly for red wines, Italy also produces some excellent white, sparkling, and fortified wines. And of course, good Italian food enjoyed in a pristine, authentic setting will only make your wine taste better! 3. Germany: Germany’s wine regions are so numerous that they are more often referred to as “wine routes,” or areas wherein travelers or visitors can follow one particular route and expect to find several wineries, whether large or small. Germany’s proximity to the Alsace region of France has resulted in a number of French and German wines that share some common characteristics. Similar to other wine-producing regions of the world, some of the best German wines come from small-scale, “boutique” vintners and estate wineries, all of which travelers can visit if they wish, although they may need help from locals or a destination specialist in order to find the location and arrange the visit. Germany is also renowned for its beer production, something that is often of interest to wine lovers. Since fine German cuisine makes use of both good wine and beer, Germany is a destination no culinary traveler should miss! 4. Australia: Avid wine lovers should definitely plan a visit to the land “Down Under.” This amazing destination offers you the delights of the Hunter Valley, Barossa Valley, the Adelaide Hills region, and the McLaren Vale region, just to name a few. The vistas in these regions are varied, all vast and beautiful, with gourmet dining and luxury accommodations to complete your ideal wine tour vacation. You can take a sunrise balloon ride over the vineyards. You can even enjoy your newly-discovered Australian wines with a bush lunch (picnic) in the Outback! 5. South Africa: Cape Town is the gateway to some of the most breathtakingly scenic wine-producing lands in the world, many of them within an hour’s drive, and others a longer journey through spectacular landscapes. Each of the regions has its own unique character, as do the wines produced there. The well-developed Western Cape includes historic villages, charming guest houses, gourmet restaurants, and world-class golf courses. Travel along the coast, enjoying the spectacular scenery of the famous Garden Route. A wine tour of the Western Cape and Garden Route will prove to be a delightful experience for all. Adrienne Mitra is the owner of Celebrations International Travel, a full-service agency focused on serving a number of niche markets, including culinary travel, cruises, tours, all-inclusive resorts, and group travel. Adrienne and her family are avid world travelers, and they are especially proud of the custom work they do for clients. Two separate conversations I had yesterday with professionals in the world of foodie Web sites left me bewildered, and inspired me to write this entry. I’m still not sure what to think of these interactions, and would be interested to see if readers out there have any thoughts to share on the subject. Well, I can’t argue with whatever gold-tinged images she might have had in mind, but what this experience taught me is that people’s perceptions and other long-held notions can be difficult at best to change or even influence. But what stood out even more was this person’s apparent unwillingness to even hear me out, or to be open to ideas in the culinary and related realms. Baffled as to what else to say, we ended the call with formalities. Call #2: This time I’m explaining our approach to culinary tours (i.e. Get out of the tour bus and actually experience the destination; per my earlier post “Escorted Tours My Way: No Whirlwind Bus Rides”.) to Caller #1’s designee. This time I decide to explain simply that our tours are customized to accommodate whatever the traveler is interested in seeing and doing, but that our culinary tours are designed to be more than just restaurant tours, that we give travelers the chance to do more than just sightsee, eat; sightsee, eat. Normally, her answer wouldn’t have bothered me, except that instead of listening or wanting to learn anything about our tours, she proceeded to tell me that “For those of us who live to eat, that’s what we want,” and that our culinary tours wouldn’t work in the foodie world. As much as I respect every individual’s right to their own opinion, I take our work and professional stance in the travel and culinary worlds very seriously. I would not want anyone to ever think that the intent of our culinary tours is anything other than to introduce travelers to the joys of the culinary world. By all means, the highlight of any culinary tour is for travelers to enjoy all the food, wine and other delights their destination has to offer. The point I think both callers missed is that Celebrations International Travel’s culinary tours are 100% customized to give travelers the opportunity to experience their destination in ways that best suit the travelers’ interests and needs. That is not to say that enjoying a host of different restaurants isn’t one way to experience a destination, but good meals can be enjoyed anywhere, without necessarily having to travel. And good memories are created through good, enriching experiences, which exploration and travel provide. You Mean I Have to Cook on a Culinary Tour? Don’t get me wrong, I of all people am all for eating, drinking, and being merry, and the food and beverages are the highlight of any culinary tour. However, these comments reminded of the need to re-state my agency’s approach to culinary travel. The idea behind a culinary tour is not simply to eat your way through your destination! (See my previous post entitled “An Introduction to Culinary Travel”.) The idea is to experience the destination through its food, wine, culinary traditions, history, culture, people, and way of life. This can be achieved in any number of ways, but the point I’m trying to convey is that a culinary tour is not the same as a “restaurant tour”. And Celebrations’ culinary tours are by no means designed to be run-of-the-mill bus tours that leave you with dizzying memories of getting on and off a bus for short stints. When I say culinary travel is meant for travelers to experience their destination, I mean just that. Get out of the motorcoach and experience your surroundings first-hand and up-close. Maybe you’d like to stroll through the vineyards in Tuscany, or enjoy wine and cheese on the patio of one of the locales. Maybe you’d like to visit a local market, where a guide could introduce you to some of the regional produce and specialty foods. While you’re there, you might see a butcher in action, and you might want to buy a fresh, juicy cut of meat and bring it back to the villa where you’re staying so you can watch the chef prepare it for you. These are all examples ways in which a culinary traveler might experience his or her destination. You might have noticed that I have not mentioned any type of hands-on cooking experience up to this point. Why? This is precisely how I would address a request that a custom culinary tour not include cooking. If chefs, bakers, or other culinary professionals or enthusiasts don’t want to cook on their culinary tours, they don’t have to! They’re on vacation, after all! And of course, although it is a culinary-themed tour, most travelers still want to sightsee, shop, or attend cultural events or festivals. Our culinary tours are designed to accommodate all of that and are customized for you. Whatever you want to see, do, and experience, we will help you make it a reality! Regardless of what interests you, or what you’d like to enjoy on your tour, a myriad of choices will always await you. The world is full of amazing destinations, and culinary travel provides an interesting and delicious way to explore them all! A tweet from @travelstour caught my attention just now, publicizing this article on foods named after places. Carolina BBQ, Texas BBQ, Georgia peaches, Maryland blue crabs. If I took more time, I think I think of quite a few more. Second, this article got me thinking: Identifying signature foods with certain places has everything to do with the very existence of culinary travel as a specialty travel niche. If places were not culturally and historically identified with certain foods, culinary travel specialists like myself would not have much to talk about, would we? Indeed, we live in a very diverse, interesting, and tasty world!